The FFPC Data Warehouse section at FantasyMojo.com provides historical data, draft ADP, and waiver wire data for the FFPC. This includes FFPC drafts currently in progress, as well as drafts completed for this season (satellite only until the start of the regular NFL season). Weekly waiver run summary data is open and available for all readers. (Individual winning transaction detail, showing the winning add and drop bids is available in downloadable .csv format as part of the premium content). Current and historical data for drafts and leagues run by the FFPC are categorized as premium content. The minimal $9.95 “Seasonal” (1 year) fee is a modest investment for access to the current and historical data on FFPC leagues (going back to 2010). Perhaps even more valuable is the ADP, draft boards, and results from the Satellite leagues (slow and live) that are conducted during the preseason. You can keep up to date with the latest draft trends by viewing the draft boards of completed and ongoing (for slow) drafts. Draft boards are updated daily. Once the NFL season kicks off, all leagues other FFPC leagues are going to be included. 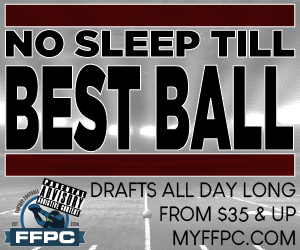 This includes Footballguys Players Championship , Main Event , and other leagues as well. no but the classic satellites are the exact same 20 round format. Check those out. DO you guys have this information? Can you make a separate category for it? Footballguys Draft Boards and ADP are exclusive to Footballguys themselves. At some point, they post that data. After the season starts, that data is available for us to display as part of the League History section. Are the in-process victory point slow draft boards posted anywhere? I found previous years, but I want to find this year’s. VP is up (only 1 so far). Is there any way of seeing the team names on the draft board? We’re not permitted to show team names on the drafts in the pre-season.